Morphisec's channel is dedicated to provide CISOs, security managers and SecOp teams practical answers to today's cyber threats and security challenges. Morphisec makes endpoint threat prevention viable again, terminating the attack kill chain at its very onset. It stops and neutralizes zero-days, advanced attacks, evasive file-based and file-less malware, ransomware, APTs and web-borne exploits before they can do any damage. Morphisec’s Moving Target Defense technology morphs the memory space so authorized code runs safely while malicious code is blocked and trapped. 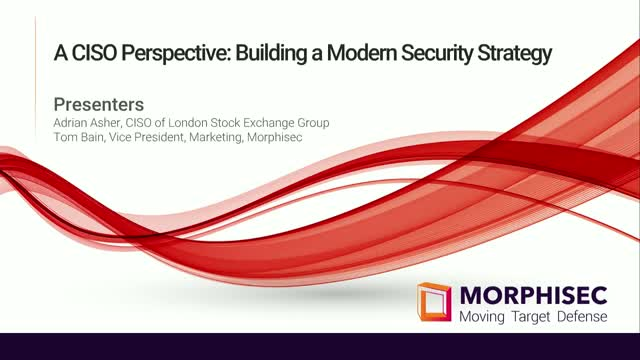 Join us for a candid discussion with London Stock Exchange Group CISO Adrian Asher on what it takes to build a modern security strategy. We'll cover industry trends and challenges, architecting a modern stack and how moving target defense helps align security with your business. The digital transformation of today's IT environments is forcing IT and Security teams to rethink the fabric, the costs and the risks inherent within virtual environments. Endpoint protection, in virtual, physical or hybrid environments, is becoming a confusing choice for buyers. Morphisec offers a truly different level of endpoint protection that fits directly into virtual environments, delivering value that other endpoint solutions cannot to protect organizations from advanced threats within virtual environments. [Security Alert Webinar] Does the threat really stop at information leakage? Many reports currently overlook the real threat that memory structures exposed by these flaws can easily become part of massive successful exploitations in the kill chain. Join us for this security alert webinar in which Morphisec experts, headed by CTO Michael Gorelik, cut through the noise surrounding the Meltdown and Spectre CPU vulnerabilities. Get insights, including tips on how to protect yourself, and have your questions answered by Morphisec security experts! Join Michael Gorelik, distinguished threat researcher and Morphisec Chief Technology Officer and Vice President of R&D, for a close look at top cyber threats targeting enterprises today. He will walk through the where, what and how of the leading attack vectors as well as explore ways to protect your company. Cybercriminals change their techniques and tactics at a mind-blowing pace. To protect your organization, you need a technology that stays two steps ahead. Morphisec Endpoint Threat Prevention was purpose-built to prevent advanced, in-memory attacks and zero-days when and where they happen – at your endpoints and in real time. Join Morphisec Customer Service Director Yuval Danieli for a live demo that will explain the nuts and bolts of Morphisec Endpoint Threat Prevention solution. Inside “Petya”: Why, How and Lessons Learned; Including a live demo of Morphisec stopping "Petya" in its tracks! Ransomware, wiper or state-sponsored attack? What made “Petya” so effective? “Petya” – Exception or the new rule? How the threat landscape has changed. Live demo on how Moving Target Defense prevents “Petya” in different scenarios.